We are excited to have brought Africa On Deck into life, after years of funding Alexandra Baseball on a shoestring budget. 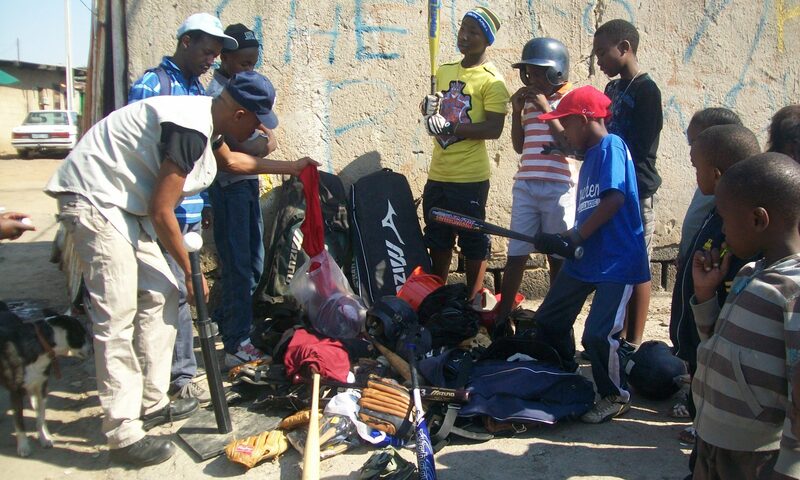 We hope our fundraising and promotion efforts help the club gain a stronger financial foothold so that it can continue to give opportunities to underprivileged children in Alexandra and serve as a model for baseball in all of Africa. Tyler Barnes is the Vice President of Communications for the Milwaukee Brewers organization and serves on the board of the Brewers Community Foundation. He is a veteran of over 30 years in the sports industry – from the Houston Astros to the Detroit Tigers and most recently as chief marketing officer for the Harlem Globetrotters. He was named Michigan’s Best of the Best by the Detroit Sports Broadcasters Association for his work in public relations with the Tigers. Tyler graduated from Trinity College in Hartford, Connecticut, in 1987 with a degree in political science. He is a native of Kansas City, Missouri. Tyler became involved with Alexandra Baseball when he and his family visited the township in 2015. In addition to his support of Africa On Deck, Tyler’s recent community work includes serving on the boards of VISIT Milwaukee, The American Red Cross Grand Canyon Chapter and, along with his family, involvement with Open Arms Home for Children in South Africa. He currently resides in Elm Grove, Wisconsin, with his wife Monica and their sons Avery and Cole. Sine Thieme is a freelance writer and author of the travel memoir Kilimanjaro Diaries. After moving to South Africa with her family of six at the beginning of 2010, she was thrilled to discover that America’s Pastime could be found in Africa, right in the heart of Alexandra – the very place she was told never to set foot in. She is very happy that she did. Helping and promoting Alexandra Baseball over her three years as The Joburg Expat gave her a glimpse into a world very different from her own, while also confirming what she always suspected was true: No matter where we all come from, we are not that different from each other. Sine grew up in Germany, graduated from the UNC Kenan-Flagler Business School with an MBA in 1993, and currently lives in Nashville, Tennessee, with her German-American family. She is very excited to join the board of Africa On Deck to continue to promote baseball and youth development in Alexandra, in Gauteng, and in Africa. Natalie Irwin, along with her husband Andy and sons Peter and John, lived in Johannesburg, South Africa, from 2010 to 2016. After she found Alexandra Baseball through Sine’s Joburg Expat blog, her family became more and more involved with the club by Andy helping to coach, Peter and John playing on the U15 team, and Natalie becoming Alexandra Baseball’s #1 fan. Over time, she took on a bigger role organizing transportation for the teams, providing a meal during games, handling social media posts on Facebook, and planning fundraising events. In May 2014, the Irwin Family was named Family of the Year by the Gauteng Baseball Federation. Upon returning to the United States in January 2016, Natalie began laying the groundwork for a non-profit organization to support Alexandra Baseball and other baseball clubs in the Johannesburg area. Africa On Deck became a reality in March 2017. Natalie grew up in New Orleans, Louisiana, and attended Agnes Scott College in Decatur, Georgia, majoring in Economics. She and her family currently live in John’s Creek, Georgia. Rich is the Co-Founder of Cameron Carmichael, a retained executive search firm based in Charlotte, North Carolina. He participates in the Council for Entrepreneurial Development, The International Association for Corporate and Professional Recruitment, and The Charlotte Rotary. Rich was the former Chair on the boards of Discovery Place and Dilworth Little League, serves on the board of Make-a-Wish, and he and his family are also actively involved with the Uptown Men’s Homeless Shelter. He is a graduate of Leadership Charlotte Class XXV. When Rich and his family were introduced to the township of Alexandra by the Irwin’s, his family collected and transported ten 50-lb suitcases of baseball equipment from Charlotte to Alexandra. After spending two days with the players handing out equipment and teaching skills clinics, Rich’s family was all in. A native of Greensboro, North Carolina, Rich graduated from the University of North Carolina at Chapel Hill with a Bachelor of Science in Business Administration. Rich, his wife Tracey, and their three children live in Charlotte, North Carolina. In 2017, Louis van Zyl was selected by the World Baseball Softball Confederation as official umpire for the U12 Baseball World Cup in Taiwan. After many years working for South Africa’s utility company Eskom as well as GE, Louis recently started his own company providing consulting and project development services to industrial clients. Louis has been actively involved in school sports from a young age, participating in Track & Field, Volleyball, and Field Hockey. He achieved South African national colours in Track & Field. His love for baseball grew out of his children’s participation in the sport. He is excited to be a part of Africa On Deck and as its local representative oversees club operations and funds distribution for Alexandra Baseball. He has also taken up umpiring and is responsible for umpire development on the South African Umpire Commission. He and his wife Miensie are newly-minted empty-nesters and live in Johannesburg, South Africa.